LAKEWOOD, NJ - BlueClaws Charities has completed its 6th annual grant process. After analyzing the applications, BlueClaws Charities handed out grants to 34 Community Partner organizations in Monmouth & Ocean Counties. 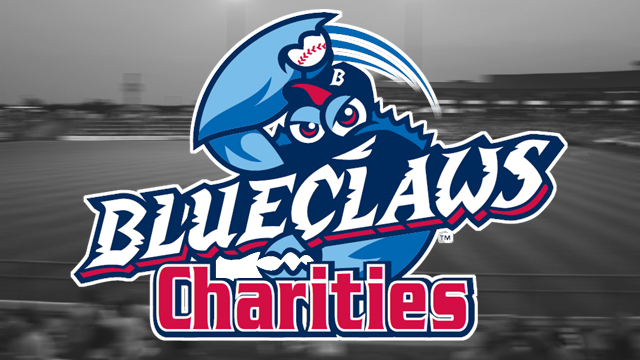 BlueClaws Charities, a registered 501c3 organization, raises money at all 70 BlueClaws home games. A 50/50 raffle, special jersey auctions, and miscellaneous programs are used to raise money during games. The annual "Phillies Winter Banquet," "ALS Celebrity Waiter Event," "Bowling With the BlueClaws," and the "BlueClaws Charities Nine & Dine Golf Outing" are additional fundraising initiatives conducted by BlueClaws Charities. "This grant program is the culmination of the BlueClaws Charities year and we are very grateful to everyone that supports the organization in any way," said BlueClaws Charities Executive Director Jim DeAngelis. "Without the support of the fans and donors, we would not be able to aid our magnificent Community Partner organizations." The following non-profit organizations received a cash grant from BlueClaws Charities (alphabetical order): ALS Association of Greater Philadelphia, American Cancer Society, American Heart Association, American Red Cross (Jersey Coast Chapter), Ashley Lauren Foundation, Big Brothers Big Sisters of Ocean County, Caregivers Volunteers of Central Jersey, Central Jersey Blood Center, David's Dream and Believe Cancer Foundation, Enable Inc., Exit 82 Theatre Company, Family Options Adoptions, Family Resource Associates, First Tee of Monmouth & Ocean Counties, Food Allergy Research & Education (FARE), Girl Scouts of the Jersey Shore, Go 4 the Goal, LADACIN Network, Lt. Dennis W. Zilinski Memorial Fund, Monmouth County SPCA, Mya Lin Terry Foundation, NJ TEARS, Northern Ocean Habitat for Humanity, Ocean County Shriners Club, Ocean County YMCA, Ocean's Harbor House, Raising Hope for Others, RJM Sports Group, Saint Vincent DePaul Society of Ocean County, Salvation Army of Ocean County, Susan G. Komen For the Cure of Central & South Jersey, Tom Giannattasio Jr. Memorial Fund, United Way of Monmouth County, United Way of Ocean County. BlueClaws Charities, in addition to the grant program, supports hundreds of non-profit organizations with gift package donations, golf outing hole-in-one sponsorships, and specialty organizations such as OCEAN, Inc., a federal program that assists the less fortunate in the community. The "Tickets for Kids Program," another BlueClaws Charities initiative, donates over 2,000 tickets to underserved youths in Lakewood and elsewhere in Ocean County. The Lakewood BlueClaws are the Jersey Shore's top stop for affordable, family entertainment. They have led the South Atlantic League and New Jersey in attendance in each year of their existence. 2015 will be their historic 15th season of family fun.